Emission reduction, green spaces, and renewable energy are some of the most talked about topics of the 21st century. With the recent passing of Earth Day, and the undying rally for improved green efforts worldwide, some industry giants are making a large footprint. It wasn’t enough for Google to be the world’s biggest search and advertising company; it’s evident that they truly do want to power the globe. Although, this isn’t the first time that Google has made a large investment in green energy. Back in 2007, Google dove into clean-tech fray, clearly stating that it would spend “hundreds of millions of dollars” to create alternative energy sources that are cheaper than coal, which as we know it is the world’s dominant fuel source and pollutant. They included that their effort RECTC (Renewable Energy Cheaper Than Coal), would consist of wind power technologies, solar power, and more. It’s sometimes tough to make the connection between search and alternative energy, but with Google at the forefront of campaigns like this, it certainly makes me feel a bit more comfortable. With enough energy to power nearly 55,000 homes, Google is making a tremendous impact on sustainability for our planet. Non-profits and other similar collaborative units have been doing their part in supporting green initiatives since the beginning of the movement. For instance, Niranjan Shah and Globetrotters Engineering Corporation work closely with the USGBC (US Green Building Council) to improve building standards and provide LEED based architecture. Although, it’s the unpredictable, long tail efforts of cash cows like Google that are helping substantially. Much like the individual, businesses must play their roles in promoting sustainability. Google entered into green technology development in startup companies and its own consumer energy tracking tools, although, they hadn’t quite moved into actual working energy fabrication. This could infer future investments by Google, perhaps leading to the acquisition of their own wind powered turbine that would facilitate their own business needs. 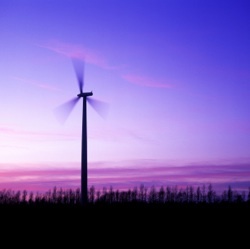 Wind turbines are used to generate electricity from the kinetic power of the wind. Historical they were more frequently used as a mechanical device to turn machinery.